Each year, brands manage to push the design envelope on one of the most core pieces of outdoor gear — tents. For 2019, brands shaved grams, used cutting-edge fabrics, and designed tents for bikes. Brands debuted thousands of products at the 2018 Outdoor Retailer Summer Market. One product in constant innovation is the tent. This list highlights the most exciting tents for 2019 we saw at the show. Some are expected, from big brands. Others house shocking innovations we’re excited to test out. 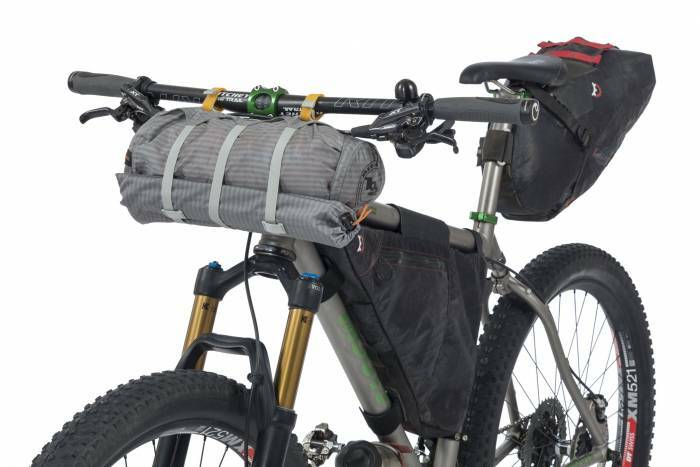 You can fit the Big Agnes Copper 2 Bikepack under your bike’s handlebars. 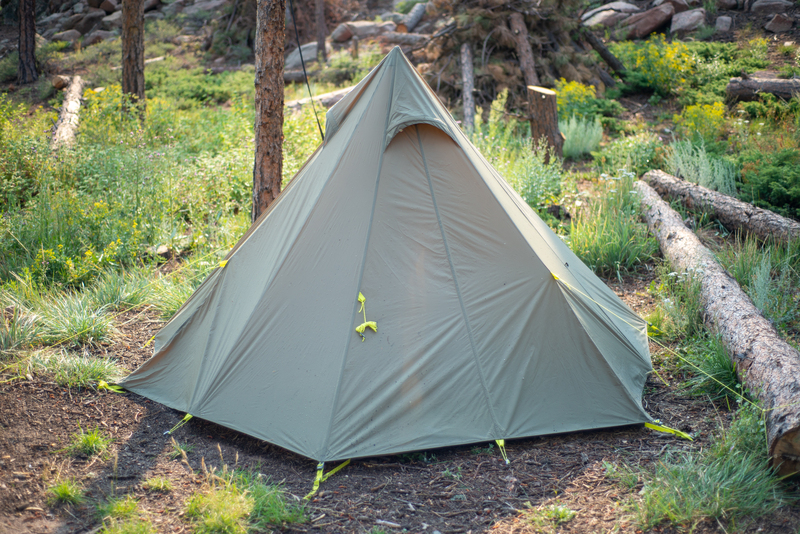 Big Agnes designed this tent specifically for bikepackers, with a compression sack and shorter pole segments than the brand’s standard backpacking model, the Copper Spur 2. Plus, the Copper 2 Bikepack has a special pocket specifically for hanging your helmet when you get to the campsite. It’s available in spring 2019 for $380 and weighs 2 pounds 14 ounces. Mountainsmith originally designed a Tipi tent in the 1980s, making significant modern upgrades to the classic tipi design for 2019. Notably, it’s lighter and uses more durable materials. 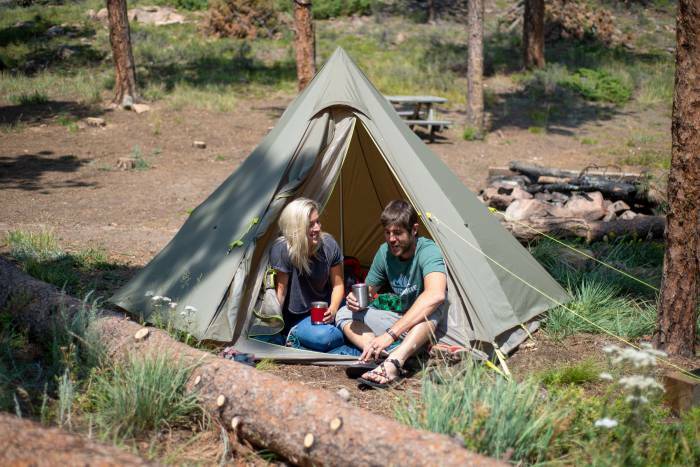 GearJunkie tested the Tipi promptly after the trade show in the wilds of Red Feather Lakes, Colo. The Mountainsmith Tipi tent proved both fun and easy to set up, thanks to its single, structural pole. It offered luxurious amounts of floor and head space, and it fended off winds exceeding 20 mph, rain, and even hail in our tests. As such, it makes for a great gathering tent and shelter for two, three, four, or even five people to wait out foul weather. For sleeping, though, its inner pole provides an obstacle for lying down and switching positions. Black Diamond hasn’t introduced a tent in years — until now. For 2019, it releases three new models. We’ve already covered the Distance Tent, an ultralight backpacking tent. But the brand also released another model designed for climbing and the mountains. 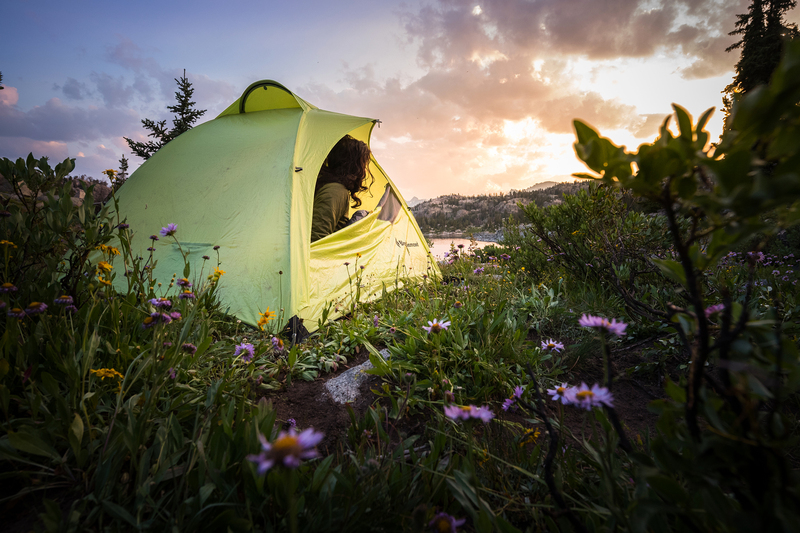 The FirstLight 2P and 3P are minimal tents that keep weight down while maximizing ventilation. At the top of the tent is a “Flow Manifold” system that facilitates airflow out of the tent much like a vent. And the Flow Manifold also allows for a central, ceiling rope exit for anchoring in on steep pitches. Outside of the tent is a 30-denier poly fabric that doesn’t stretch when wet and should withstand mountain conditions. The brand claims it stays tight as a drum in windy conditions. Meanwhile, the guylines use a polyester sheath with Dyneema core to keep them from stretching. 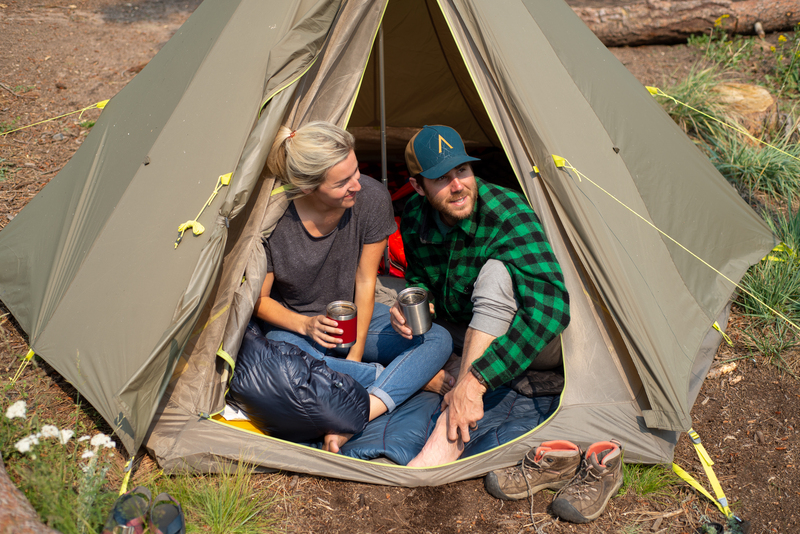 Black Diamond releases the FirstLight, along with the Distance Tent, in 2019. 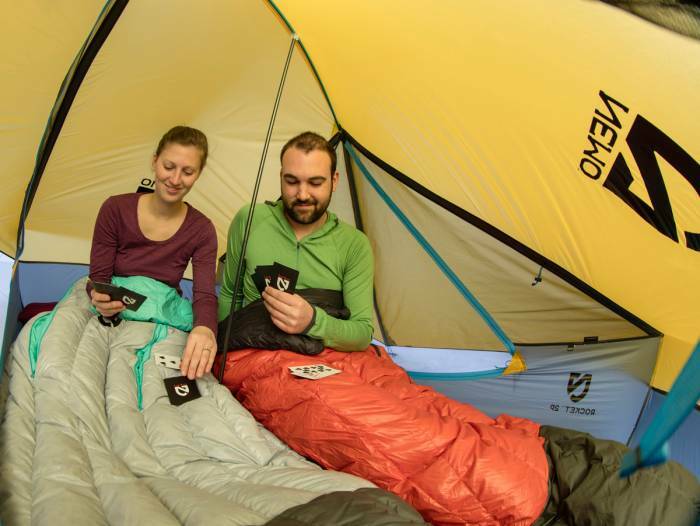 NEMO increases tent roominess with its Rocket model, a box-like, A-frame tent. 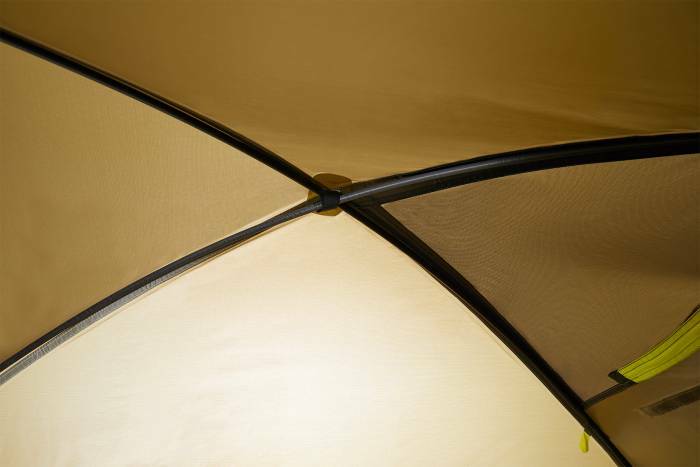 With what the brand calls T-poles, the corners of the tent stretch taught and raise vertically to nearly 1 foot tall. This leads to more room at the base of the tent. 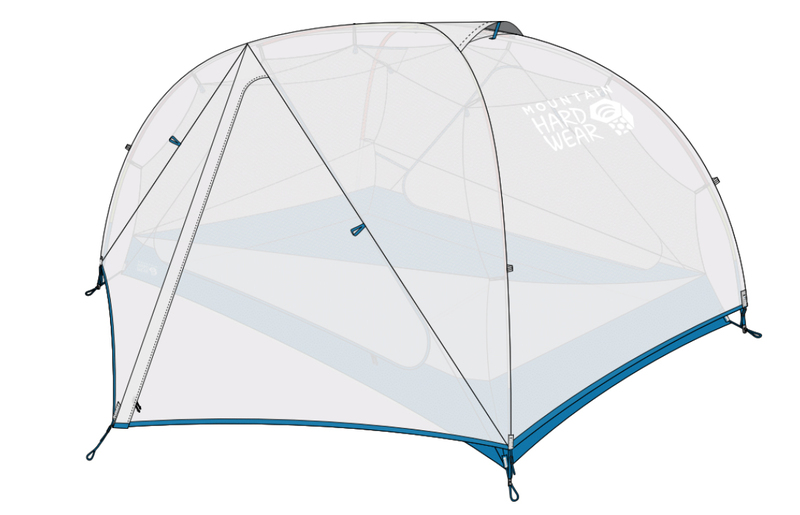 Lying in the tent at Outdoor Retailer, our editors were surprised with how roomy it felt despite its notable svelte weight of 22 ounces. In addition to the proprietary T-pole design, when guyed out with its carbon struts, the tent gains even more room at the head and foot of the shelter. The canopy uses 7-denier ripstop and the floor 10-denier. The Rocket launches this spring for $450. MSR employs new tent poles and weatherproofing in its revamped NX line for 2019. Easton, maker of arrows, baseball bats, hockey sticks, and tent poles, spent four years creating the Easton Syclone Poles. The poles use a ballistic fiber that outmatches aluminum and carbon in strength and elongation. Bend it, beat it — you likely won’t break it. The second big update is MSR’s new Xtreme Shield waterproof coating. Tested in MSR’s lab, Xtreme Shield was found to stay waterproof three times longer than Eurothane coatings. While Syclone is totally new, Xtreme Shield was first introduced in 2018 with the Hubba Tour Guideline Pro tent. For 2019, the waterproofing comes to the Hubba NX line of tents. 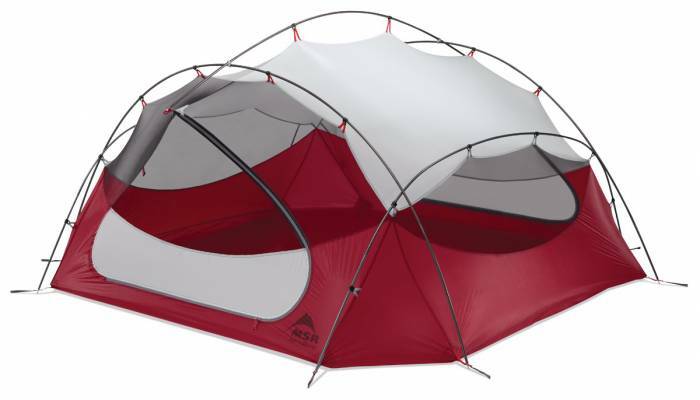 MSR launches the Hubba NX Tent line in one- to four-person models January 2019, priced from $380 to $700. 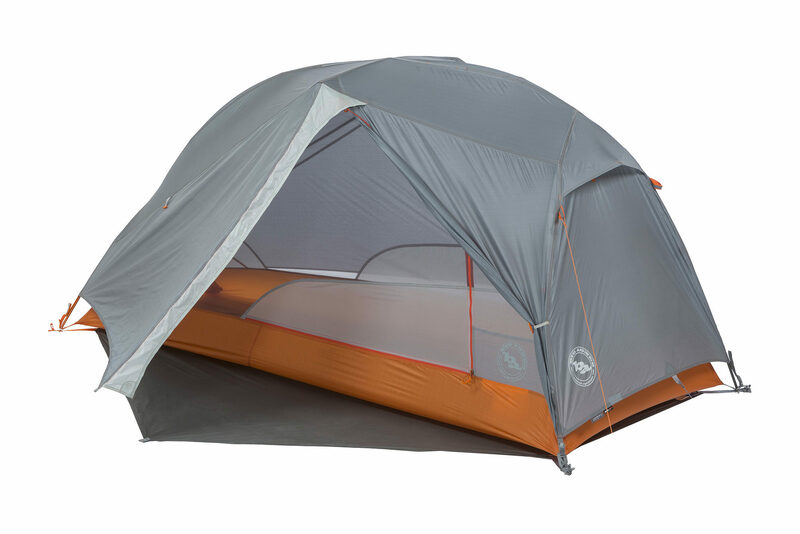 What the brand calls an “outdoor palace,” the Meteor 4 is a roomy freestanding tent that maximizes interior space. With a two-pole design with steep wall angles for livability, the Meteor 4 is easy to set up and has 55 square feet of room. 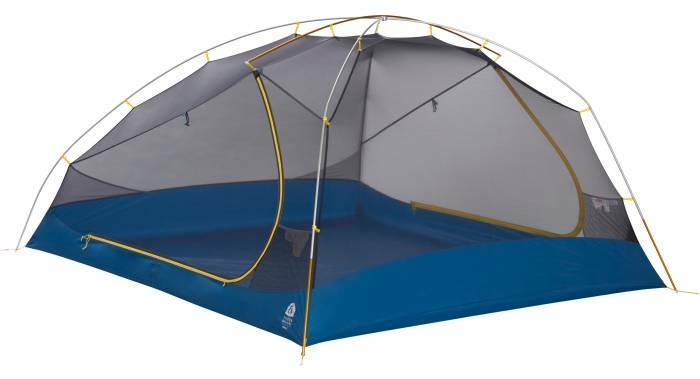 The tent has two doors and two vestibules, and the fly can be rolled up easily for stargazing. 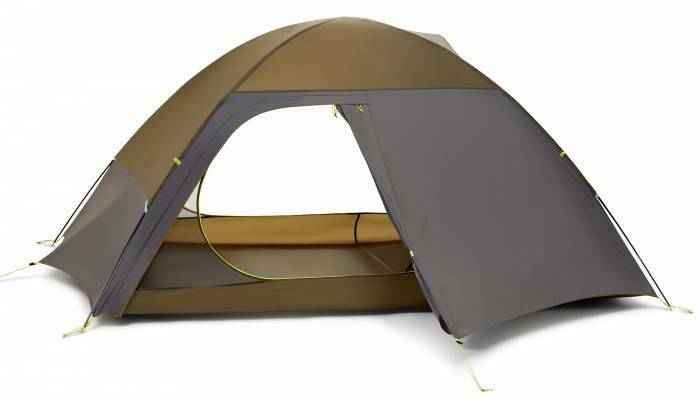 The Meteor 4 appears heavy at 6 pounds 1 ounce, but divide the shelter among four campers and it’s actually quite light. Sierra Designs launches the Meteor 4 in spring 2019 for $450. The lack of a rainfly on the Vargo No-Fly means setup is a little simpler. Vargo, a maker of titanium outdoor gear like stoves and bottles, introduced a tent at Outdoor Retailer with a sturdy design and low weight. The No-Fly 2P weighs 2 pounds 10 ounces (minimum) and has an integrated waterproof fly. The fabric used on the Vargo is 20-denier, so it can likely handle sharp rocks and sticks at the campsite as well as the daily transition in and out of your backpack. Vargo integrated a patent-pending “Quadrapoint Setup System” to enable users to set up and take down the tent while keeping the interior protected from the elements. The Vargo No-Fly 2P is available in 2019 for $500. Dyneema earns praise for its tear resistance and stout durability. But it’s normally a thick material found in backpacks, sailing, and apparel. Big Agnes releases its lightest freestanding tent with the Fly Creek HV1 Carbon, made from — you guessed it — Dyneema. It also uses carbon tent poles to shave weight and packs down exceptionally small. Other tent-makers have used Dyneema before, like Japanese company Locus Gear. 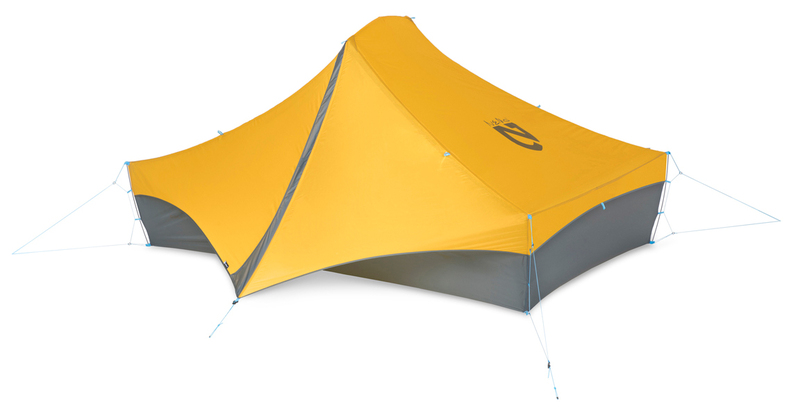 The Big Agnes tent weighs similarily to other Dyneema tents with its one-pound weight. Get ready for the Fly Creek HV 1 Carbon next spring when it hits shelves for $750. Mountain Hardwear introduced a complete redesign of its climbing and mountaineering products in June this year on the Grand Teton. 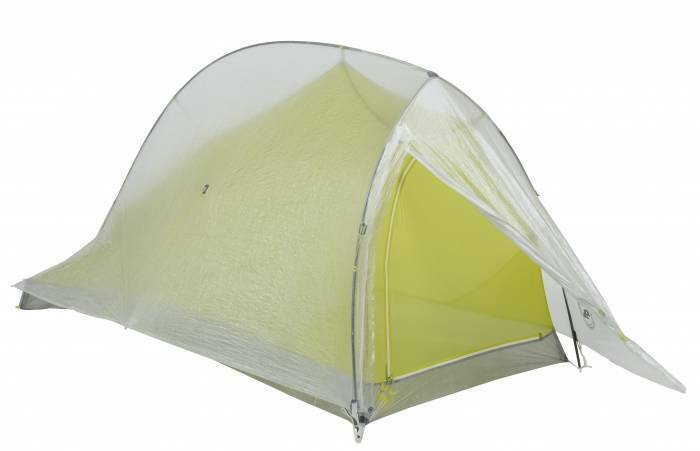 But outside of climbing, the brand offers an ultralight backpacking option with the Aspect tent. Maximizing ventilation, the Aspect uses a 3/4 mesh canopy beneath the rainfly that’s great for venting heat and stargazing. It borrows from the brand’s core mountaineering tent’s design and thus should withstand high winds and brutal weather conditions. Mountain Hardwear minimized bulk in the Aspect by removing plastic clips from the tent body with a new canopy-to-pole attachment system. The Aspect launches in two- and three-person models for $430 and $480, respectively.